You join Prince Chrom of Ylisse and his militia, the Shepherds. They are fending off the forces of the kingdom of Plegia, turned mad by their devotion to the dark dragon Grima. As well as the invasion, the undead forces known as The Risen have appeared across the land, and an impossible masked warrior wielding the sacred Falchion sword has appeared. Send your team of warriors into battle against the enemy forces, completing mission objectives to advance. In Classic Mode, losing a character in a mission will remove them forever. 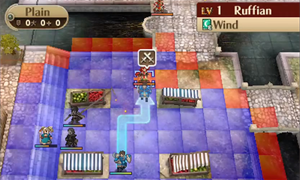 In Newcomer Mode, you can recover fallen units and save anywhere.